The crack of the bat, the roar of the crowd! 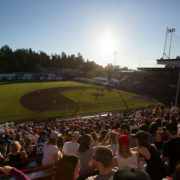 The Vancouver Canadians start their season on June 15th with their first game at Scotiabank Field at Nat Bailey Stadium on June 20th. Fans can expect a post-game fireworks extravaganza presented by Whistler Brewing. The first 2,500 fans to the ballpark will also receive a magnetic schedule giveaway also presented by Whistler Brewing. 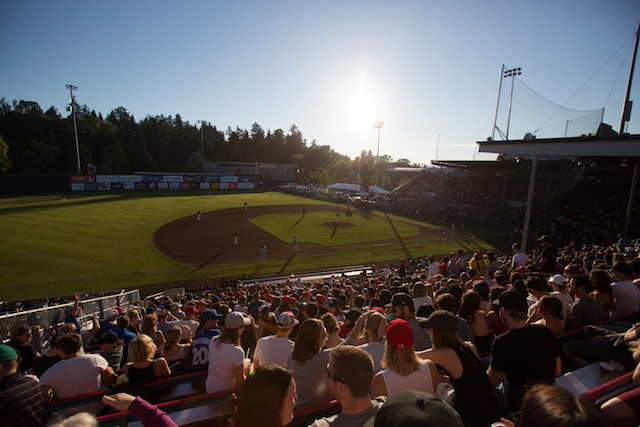 This year, on top of affordable family fun cheering on our hometown boys, fans can enjoy 8 Fireworks Extravaganzas, 7 A&W Family Fun Sundays, 6 Scotiabank ‘Nooner at the Nat days, 3 Superstar Series Appearances and much more! Here is the full promotional calendar for the Vancouver Canadians. Tuesday, June 20, 2017 HOME OPENER: Fireworks Extravaganza/Magnetic Schedule Giveaway (first 2,500 fans) Presented by Whistler Brewing. Wednesday, June 21, 2017 Fireworks Extravaganza Presented by Rogers. Thursday, June 22, 2017 Scotiabank ‘Nooner at the Nat in support of Pacific Autism Family Network. Friday, June 23, 2017 Presented by Waste Management. Saturday, June 24, 2017 Fireworks Extravaganza/Seat Cushion Giveaway (first 500 fans). Presented by Cloverdale Paint. Sunday, June 25, 2017 A&W Family Fun Sunday/Pennant Giveaway (first 1,000 kids 12 and under). Thursday, June 29, 2017 Cooler Bag Giveaway (first 500 fans). Presented by Developmental Disabilities Association. Friday, June 30, 2017 Scotiabank ‘Nooner at the Nat. in support of Big Brothers of Greater Vancouver. Saturday, July 1, 2017 Canada Day Fireworks Extravaganza Presented by Scotiabank. Sunday, July 2, 2017 A&W Family Fun Sunday/Adjustable Cap Giveaway (first 500 kids 12 and under). Monday, July 3, 2017 Autographs – Fergie Jenkins & Gaylord Perry/Card Giveaway (first 1,000 fans). Presented by VIA Rail. Wednesday, July 12, 2017 Presented by Vancouver Coastal Health. Thursday, July 13, 2017 Dog Day Of Summer Presented by Petcurean Pet Nutrition. Friday, July 14, 2017 Scotiabank ‘Nooner at the Nat in support of Variety – the Children’s Charity. Saturday, July 15, 2017 Fireworks Extravaganza/hey y’all! Cowboy Boot Koozie Giveaway (first 1,500 fans, 19+) Presented by hey y’all! Southern Style Hard Iced Tea. Sunday, July 16, 2017 A&W Family Fun Sunday/Youth Jersey Giveaway (first 500 kids 12 and under). Monday, July 17, 2017 Presented by The Yale Saloon. Tuesday, July 18, 2017 Superstar Appearance by David Justice/Card Giveaway (first 1,000 fans) Presented by BC Sports Hall of Fame/Blakes. Wednesday, July 19, 2017 Scotiabank ‘Nooner at the Nat. in support of Big Sisters of BC Lower Mainland. Friday, July 28, 2017 Presented by The Salvation Army. Saturday, July 29, 2017 Fireworks Extravaganza Presented by Scotiabank. Sunday, July 30, 2017 A&W Family Fun Sunday/Photoball Giveaway (first 1,000 kids 12 and under). Tuesday, August 8, 2017 Superstar Appearance by Corey Koskie/Card Giveaway (first 1,000 fans). Presented by BC Sports Hall of Fame/Blakes. Wednesday, August 9, 2017 Kevin Pillar Bobblehead Giveaway (first 1,000 fans). Presented by Scotiabank. Friday, August 11, 2017 Superstar Appearance by Fred McGriff/Card Giveaway (first 1,000 fans). Presented by BC Sports Hall of Fame/Blakes. Saturday, August 12, 2017 Fireworks Extravaganza Presented by Carter Honda. Sunday, August 13, 2017 A&W Family Fun Sunday/Batting Helmet Giveaway (first 1,000 kids 12 and under). Monday, August 14, 2017 Noah Syndergaard Bobblehead Giveaway (first 1,000 fans). Presented by The Keg Steakhouse + Bar. Tuesday, August 15, 2017 Presented by Vancouver Board of Parks and Rec. Sunday, August 20, 2017 A&W Family Fun Sunday/Kevin Pillar Superhero Cape Giveaway (first 500 kids 12 and under). Monday, August 21, 2017 Coors Snapback Cap Giveaway (first 500 fans, 19+). Saturday, August 26, 2017 Presented by Coors Light Fireworks Extravaganza Presented by Holborn. Sunday, August 27, 2017 A&W Family Fun Sunday/Umbrella Giveaway (first 500 fans). Monday, August 28, 2017 Team Photo Giveaway (First 2,500 fans). Presented by Van Houtte Coffee Services. Tickets are on sale now starting at just $14! Follow the team on Twitter, Facebook, and Instagram and use the tag #AtTheNat.